I love making lasagna in all kinds of different ways but I really appreciate the little twist this recipe offers. It’s also so easy to throw together. It does sort of feel like cheating when making this Ravioli Lasagna. Using store-bought fresh ravioli and making a six-ingredient marinara with spinach filling that’s just stirred together works great for weeknights around here. Let me also mention it’s delicious. Just take the fresh ravioli right from the package cooking it to perfection with sauce and spinach . It’s so easy. This recipe can also be converted to meatless by substituting sautéed mushrooms for the pepperoni. 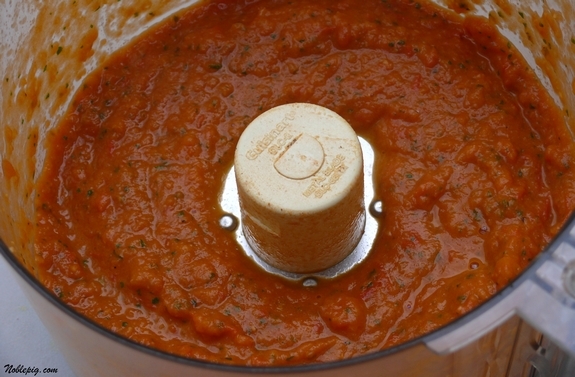 And to make it even easier, commercial pasta sauce, alfredo or even pesto may be used in place of the marinara. Now there are just no excuses to not try this out. Heat olive oil in a large saucepan over medium-high heat. Add onion and sauté 2 minutes. Stir in garlic and tomato paste; sauté one minute more. 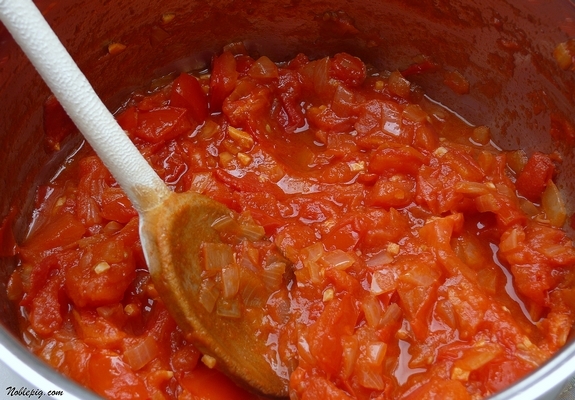 Add tomatoes, reduce heat, and simmer 10 minutes, stirring often. Puree in a food processor or blender with basil and season to your liking with salt and pepper. 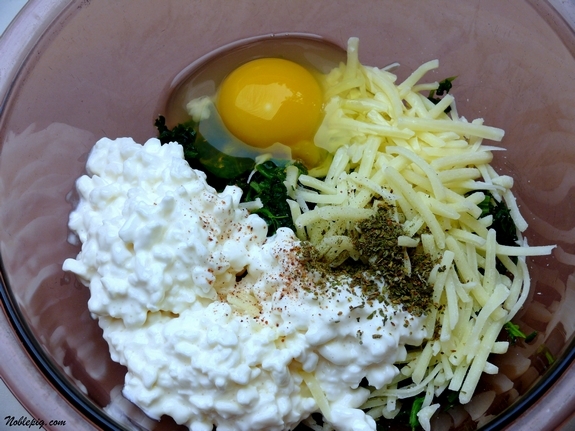 In a separate bowl combine spinach, mozzarella, cottage cheese, oregano leaves, egg and nutmeg. Coat six 10-oz. ramekins with nonstick spray. If you don’t have this size ramekin, use a 9″ square baking pan instead. Spread 2 Tablespoons tomato sauce on the bottom of each ramekin. Arrange 5 ravioli on the sauce, overlapping slightly. Top with 2 moreTablespoons of the sauce and 7 slices of pepperoni. Spoon 1/2 cup spinach mixture over the pepperoni, then top with 5 more ravioli. Finally, spread with an additional 2 Tablespoons sauce. Coat one side of six small sheets of foil with cooking spray. 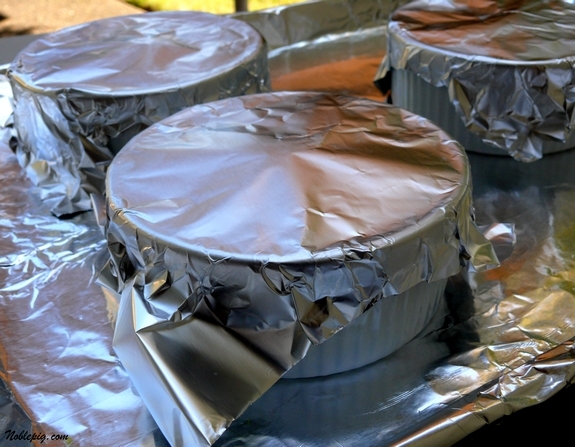 Tightly wrap each ramekin in foil, coated side down. Place them on a baking sheet lined with foil, and bake for 30 minutes in a 400 degree oven. Let stand, wrapped, 15 minutes to cool slightly and set up. Remove foil. Unmold ramekins by running a pairing knife around each, then inverting onto serving plates. Sprinkle with Parmesan before serving. I just had to bring my camera to the dinner table. What else is new. Coat six 10-oz. ramekins with nonstick spray. If you don’t have this size ramekin, use a 9″ square baking pan instead. Spread 2 Tablespoons tomato sauce on the bottom of each ramekin. Arrange 5 ravioli on the sauce, overlapping slightly. Top with 2 moreTablespoons of the sauce and 7 slices of pepperoni. Spoon 1/2 cup spinach mixture over the pepperoni, then top with 5 more ravioli. Finally, spread with an additional 2 Tablespoons sauce. Ok, I just had breakfast yet I’m drooling over this. What an awesome twist! Lasagne was one of the first meals our daughter learned to make by herself. 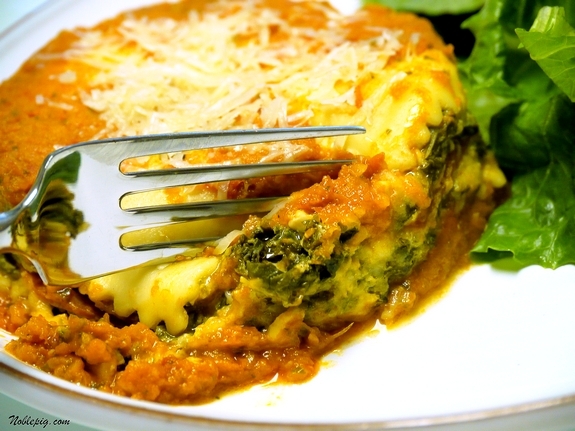 Love lasagne.I have never heard of nutmeg in it, and the spinach in your recipe is appealing to me. It looks delicious and sounds it. However, you should not use foil with the coated side next to the food as it tends to leach very small amounts of aluminium into the food Shiny side out, always! Mmmm! That sounds good! Sounds kinda similar to my Pizza Pasta, recipe can be found in my blog. Along with a couple of pictures, that are not nearly as good as yours. Bookmarked!!! I want to try this for my kids. My daughter loves cheese ravioli and spinach. My son, anything that remotely looks and tastes like a noodle. Looks yummy! You made me chuckle with your comment about bringing your camera to the dinner table. I took mine on our trip to the Adirondacks in hopes of having an awesome meal (which we didn’t) and when I took it out Grumpy was like “you put that thing away”. he he. 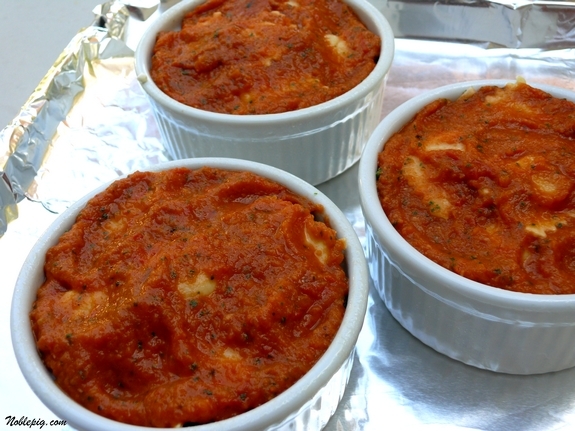 Absolutely delicious… love the ramekin idea, and the spinach mixture with pepperoni, oh to die for, even your sauce looks fantastic, truly superb dinner!! You are such a clever lady!!! I love taking shortcuts and this is definitely a shortcut worth taking!!! Alright. This looks intriguing. I’m going to have to try this recipe out. Not only do I love this b/c it’s in ramekins, but I love the ravoili. How wonderful! Now how cool is that? Individual ravioli-lasagnas! I like this idea. What a nifty and original idea. This looks so good an what an interesting way to fix lasagne. Cathy, I have saved so many of the recipes you post. You find us such good stuff!!! Making lasagna in individual servings is a very clever idea. I have some ravioli that would be perfect for this. Thanks for an excellent recipe, Kathy. That does look delicious. I’ll have to try it. Hopefully, my guys will eat it with the spinach rather than scrunch up their noses and turn away. Brilliant idea! I’d totally try these without the pepperoni! What a great idea, and I bet the kids love the fun shape…mine would. Ohhhh…I can not wait to make this!!! Question: I need to freeze these ramekins of goodness. How should I defrost/cook them when they are frozen? My hubby just bought me a bunch of small ramekins similar to those pictured and this recipe would be a great way to break them in! Not only that, whenever I make lasagna I am always left with this huge pan and transferring leftovers out of it is a real pain! What a great idea! My boys like different things so I can easily make adjustments for their tastes! Brilliant! You are so clever! What a fantastic idea using raviolis and putting them in ramekins. I will be trying this recipe soon. What a great idea and a super way to practice portion control. We never seem to be able to leave lasagne leftovers, so this could be a cure for that.Do you think one could freeze the prepped casseroles before cooking? Ah, vey clever Cathy. I love your twist version. What a terrific recipe. I’ve seen this before but without your wonderful add-ins. I can just imagine the faces and comments you get from the guys at your table :-). Have a great day, Cathy. Sounds like a good idea. But I can’t see my menfolk satisfied with just 11 ravioli, so I guess I need to triple this. What a great combination of flavors and seasonings. That looks like an excellent luncheon meal for guests. Individual ramekins are a good idea. Thanks for sharing this one. I will definitely try it. Love everything about this dish!! Definitely on my growing list of things to make – too much good food and not enough time! First of all, the recipe looks delicious. Secondly, I love the idea of individual lasagnas. Bet you can freeze them too. 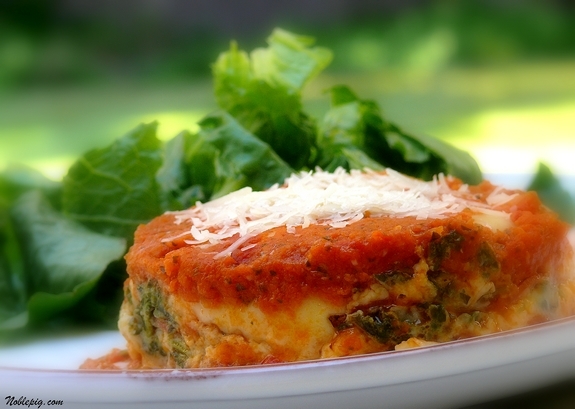 Love ravioli…Love lasagna…you could not have combined two better foods! We’re definitely going to try this over at Bitchin’ Kitchen and yes, the freezing factor is always great…ravioli lasagna for days!! I am ordering the larger 10 ounce ramekins now. I must have this. Pre-portioned lasagna…would it be bad if someone had more than one? 🙂 How can you refuse extra lasagna? What a brilliant idea! I am totally stealing this the next time I crave lasagna. This I have to make, yummy! Ohhh that looks terrific. So different. Love the idea that it’s fairly easy to make….great…I just made my first Julia Child recipe and easy and simple sounds wonderful right now! What an elegant presentation for such a quick meal! You are a genius. Really. This is perfect for a weeknight meal! I would never had thought to use ravioli. This is beautiful! 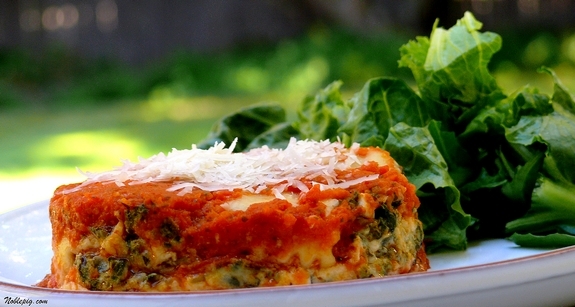 Love lasagna and new ways to make it. I really like doing individual ones in the ramekins! Feed me, feed me! What a great idea! I love the individual ramekins. I’ve got to get some of those! I love that last shot with the fork. It’s fantastic! Oh, that sounds fun! I do love to make lasagna but it is quite a production to do it the old fashioned way. This approach is definitely worth a try! I used to make a ravioli lasagne from Real Simple magazine, but I love this recipe with the individual ramekins!!! I made your coconut lemon cake from last yr and will be posting it soon. It was amazing! You are a mom after my daughter’s heart! She will LOVE this. I love this idea of using ravioli to make lasagna and the individual servings are great! Looks yummy and uber comforting. I could go for that now, like right this minute…..
Looks delicious and I love the individual serving sizes! BTW, it’s not cheating if you make your own sauce! WOW love this.. What a great idea and so unique. Cannot wait to try this as I know this wont last long in this house!! This is genius! I love the individual ramkins, and how cool to use ravioli! Geez, I’m Italian and never thought of that! YUM! What a neat idea! Looks delicious!! I made a similar dish a while back using gluten-free ravioli. It worked really well, because if you used the ravioli the typical way, it tended to fall apart. 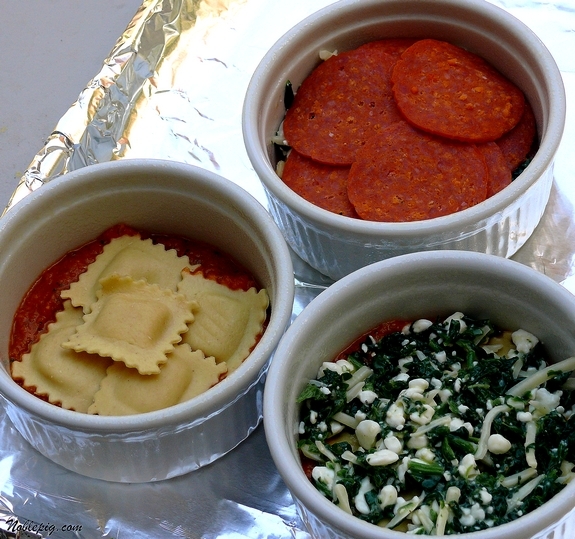 But, your addition of spinach and pepperoni and serving in a ramekin is fabulous. Who doesn’t like their food served in a ramekin? One’s own special little dish. That’s pampering for sure! I’ve just done something similar, inspired by two little Le Creuset mini-coquettes I found on sale at a discount store, and some ravioli I bought in the Italian section of Providence. It felt just a little bit like cheating to make “lasagne” out of ravioli, but the taste was oh-so-good. Oh yum! This looks great…and that is easy! I’ll be giving this a try! This sounds so delicious and I’m sure my kids will love the individual portions. Brilliant! Made this last night with a few adjustments to suit personal taste, and used jarred marinara sauce for convenience. I cut some quantities to make 4 ramekins cause there’s only 2 of us and I didn’t want more than 2 servings left over. I also answered my own question re freezing and while it works to prep and freeze the casseroles before cooking – why not do it after. That way you can rewarm leftovers in a microwave rather than using the oven. Great idea with delicious results for a quick dinner. Thanks Cathy. Oh my..this looks delicious, I love pastas with spinach! I’ll have to try this, thanks for another great one! I made this in a big casserole dish and it quickly became a family favorite here! The second time I made it, I used cheese ravioli and hot spanish chorizo instead of the pepperoni….delicious!! Hi! I’m Cathy. I’ve escaped from a peculiar Northern California college town that built an underground tunnel to save toads from the potentials of vehicular frog-slaughter. I now live in Mcminnville, Oregon where my husband and I have planted a vineyard, started a winery and make wine in the heart of Oregon wine country. I love mayonnaise, butter and Jewish men. Barry, Jerry and Larry come to mind. Gluttony is my sin of choice. Welcome to my weird and wonderful world. Copyright 2012-2018. Noble Pig. All Rights Reserved.